Pure 3-Way Commercial uses a specialized polarized blend of natural lemongrass and other safe botanical insecticides to suffocate mites and other leaf dwelling insects on contact. Unlike other products on the market, insects will never develop a tolerance to this formula. 3-Way also kills through ingestion, so it is effective on the bugs that escape contact during application. In addition, it is a natural anti-fungal that helps kill and prevent mold and mildew from infecting plants. 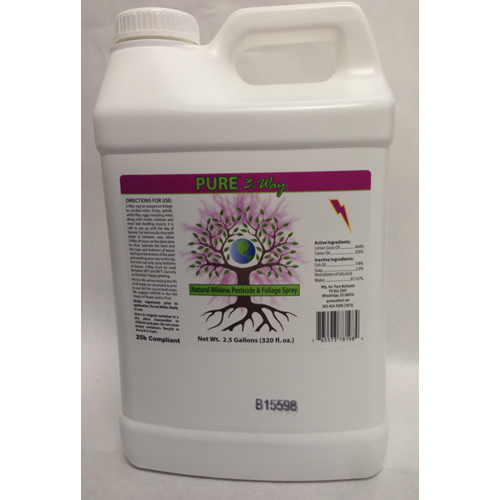 3-Way also uses a polarized fish oil to boost your plants’ systems while fighting pests. Pure 3-Way Commercial is a 25 B exempt pesticide and fungicide, meaning all ingredients have been deemed safe for the environment and planet by the EPA. Commercial grade non-RTU. Mix with 9-18 parts PH balanced water.